Television spinoffs are born holding an awkward pose, caught between embracing nostalgia and declaring independence. The stakes were even higher for AMC’s Better Call Saul, which carried with it the blessing and the curse of spiritually succeeding Breaking Bad, among the most ballyhooed television dramas of the past decade. Saul’s surprisingly excellent first season acquitted the show’s premise, but this isn’t a case where proof of concept is the tallest hurdle to clear. Season two is in a more precarious position than the debut season, because as the memories of Walt, Jesse, and the world’s most resilient Pontiac Aztek slowly fade, Saul is under greater pressure to stand on its own. Based on the pair of episodes screened for critics, Saul is doubling-down on the deliberate, tonally ambiguous storytelling it established in season one. If the first batch of episodes was shouting “This show is not that show,” the second batch is sitting stone-faced and waiting for that message to sink in. The show is still replete with references to its forebear—some subtle, others decidedly not—and Saul takes many of its visual cues from Breaking Bad, which never met a wacky point-of-view shot it didn’t like. But it’s now safe to say that Saul isn’t much of a spinoff and more like a brand extension too thoughtful and lovingly executed to come across as one. Saul is a fundamentally different show than Breaking Bad, but it is very much its own thing, which is an achievement in and of itself given the length of Heisenberg’s shadow. It’s so fully realized that five years hence, if Saul can manage to survive that long, it may not be as easy to tell whether it’s the chicken or the egg. Season two picks up exactly where the first season left off, with “Slippin” Jimmy McGill (Bob Odenkirk) waffling between the lawyerly straight life and the quick money and adrenaline of his con games. But it quickly becomes clear that Jimmy’s problem is differentiating the two. Even the most esteemed and scrupulous attorneys bend the truth to its breaking point and then protect their self-images by compartmentalizing the unsavory details. Jimmy doesn’t see the world in the same white-hat-black-hat way. A con is a con, whether the stage is a courtroom or a dive bar. He’s more superhero than antihero, blessed with above-average people skills and improvisational mendacity but cursed by people’s inability to accept those qualities if they’re not presently benefitting from them. 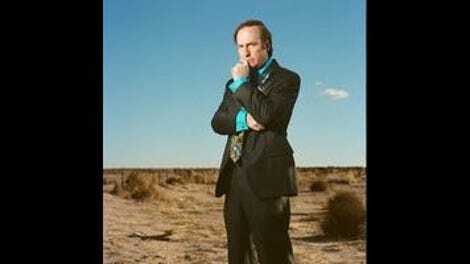 Creators Vince Gilligan and Peter Gould have done a superb job of expanding Jimmy to leading-man size, and Odenkirk continues to marvel as the sad sack who will eventually become the infamous Saul Goodman. Saul is in no rush to catch up to the point where Saul Goodman’s life intersects with Walter White’s. That’s not always a good thing, not because Saul needs to be Breaking Bad retold through another lens, but because the show takes place so early in Jimmy’s metamorphosis, it’s easy to forget who he’s supposed to be. Just as in the first season, season two opens with black-and-white shots of stretched bread dough and swirls of cream cheese frosting to establish Saul Goodman’s post-“Felina” life as a Cinnabon manager who averts eye contact whenever possible. But that’s the only real connection to the character Breaking Bad fans fell in love with, and embracing Saul means accepting that it’s neither the same show, nor about the same character. Once Jimmy formally becomes Saul and hires Hewell as his body man, the client who burned down his life is just around the corner, so Saul plays like an origin story in extreme slow motion. Fortunately, Jimmy is a fascinating character in his own right, but season two requires yet another recalibration of your expectations for what the show is supposed to be. Then it’s all too easy to wade back into Jimmy’s seamy world and join him as he deepens his relationships with the people in his life, including Mike Ehrmantraut (the ever-stellar Jonathan Banks) and Kim Wexler (Rhea Seehorn). Jimmy’s relationship with Kim looms larger in season two, and through their unlikely bond, he begins to see the width of the gap between the legal eagle he could be and the shyster that feels more natural to him. Saul still has a ribbon of sadness running through it thanks to Jimmy’s brother Chuck (Michael McKean), a lawyer so well-regarded that his firm goes out of its way to accommodate his psychosomatic electromagnetic sensitivity. The only thing that can get Chuck out of his darkened house is the threat of “Slippin’ Jimmy” encroaching on his turf, and even as Jimmy pines for a deeper bond with Kim, Saul’s most frustrating relationship is the one between the feuding brothers. That Jimmy’s sibling rivalry feels worth investing in speaks to how self-assured Saul continues to be in season two. Gilligan and Gould have been wise to set the show far apart from its ancestor, such that it becomes a draw for its clever writing, inventive direction, and nuanced performances rather than its proximity to another story set in the same universe. At its best, Saul isn’t Bad.